“Top of the world!” I wanted to shout, and probably would have, if I thought my voice would echo confidently off the surrounding snow-capped peaks rather than squeak out like a terrified yodel. Let me be totally honest: I am not very fond of heights. That is why stepping off a mountain at 4,000 metres with nothing but nylon webbing separating me from certain death would seem a strange thing for me to be doing. Still, here I am, paragliding over the Aletsch Glacier, the longest alpine glacier in the world and a UNESCO World Natural Heritage Site. The flight also affords a bird’s eye view of the Swiss Alps, and of the neat, orderly nature of the landscape. Green, lush valleys sweep up to rock and snow. Charming villages and heavy hewn timber chalets are perched on steep, tumbling embankments. Ribbons of roads switch-backing skyward, cling to precarious mountainsides. I hear the faint clang of goat bells and scour the grassy slopes for Heidi. The heart-stopping scenery is just beginning to make me forget my trepidation. That is, until my pilot decides it is time to head earthward, and tucks in a wing in a move that has us spiralling down 600 metres in a matter of seconds. Perhaps I might have enjoyed this magnificent view in a more civilized manner. Trams, cable cars, and cogwheel railways whisk the less adventurous but more sensible travellers up most famous mountainsides to provide similar views. 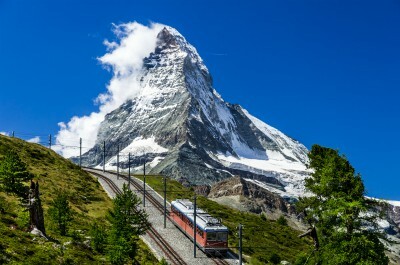 It is incredible how close to the glaciers and imposing rock faces these mountain trains will take you, and the rail runs with the clock-like efficiency the Swiss are renowned for. After our tandem kite touches down on the safe earth, however, and my head has stopped spinning, I am pleased that I have both faced a fear and been rewarded with such an unparalleled view. 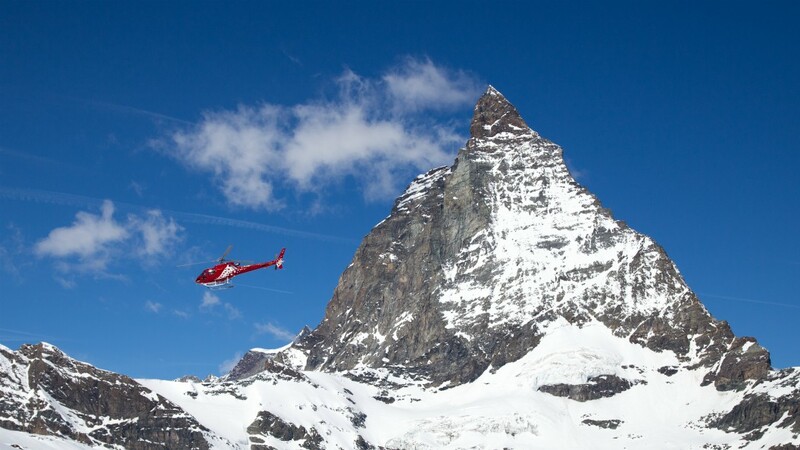 The next day, my wife and I decided to climb the Matterhorn, in a manner of speaking. Aboard a helicopter, we strayed close enough to the peak to see the climbers hut used as a resting place before adventurers set off for the summit, and the ropes that dangle down the north face. Though not the tallest of Switzerland’s mountains, none is more majestic than this twisting and snow encrusted monument, jutting its pyramid peak 4,478 metres into the blue alpine air. The four faces of the mountain are so steep that snow does not accumulate and avalanches are so common that they have formed glaciers at the base. Our helicopter took us vertically up the rock wall, breaking over the pinnacle, before plummeting down the other side in another stomach-churning joyride. After our helicopter thrill ride we decided on a less onerous and more popular vantage point for the imposing Matterhorn, from the 3,100 metres Gornergrat. We walked along the glacier fed Vispa River to the train station, and then caught the cogwheel railway that ascended through a pine and larch forest to the viewpoint and restaurant above. Edward Whymper, famous for conquering many of the regal peaks of the Canadian Rockies, was the first man to climb the legendary Matterhorn in 1865. Four of seven fellow climbers lost their lives. Even today, only experienced climbers accompanied by a mountain guide can embark on the ascent. As climbing is not for me (I’ve done my adventurous bit! ), we instead enjoy a traditional Swiss fondue and a cold beer while looking out across the canton of Valais and its striking panorama of snow-laden peaks, 47 of which reach heights of over 4,000 metres. Valais is home to 2,200 kilometres of ski and snowboard runs, and 320 kilometres of winter hiking trails. Below us is the charming mountain village of Zermatt, which can only be reached by rail. This car-free resort town is nestled in a valley of high altitude mountains: Monte Rosa, Dent Blanche and the Matterhorn. From Zermatt the legendary Glacier Express starts its journey to St Moritz. The slowest express train in the world transports visitors on an eight-hour journey, crossing 291 bridges and entering 91 tunnels. Originally a winter conveyance between the two legendary ski areas, it is now most popular with sightseers. Large windows can open to smell the fresh mountain air or get an unencumbered view of the meadows, valleys and picturesque villages. It is a masterpiece of railroad engineering, the highlight of which is the crossing of the Oberalp Pass at 2,033 metres. Switzerland is known for a lot of things – cheese, watches, bankers and chocolate. For me, after floating around in the air like a cloud, the defining image of the country is its awe-inspiring Alps, heartbreakingly beautiful whether admired from the air or from the ground. 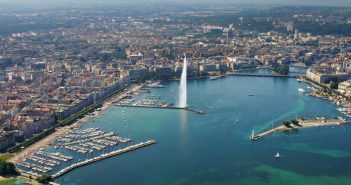 More Information: The Swiss Pass allows unlimited travel on an integrated network of trains, buses and boats. There are several passes available, some for two people travelling together, others for families. Some passes include admission to museums or hotel discounts. The transit system is so good you can get by without renting a car. For further details, visit www.sbb.ch/en. 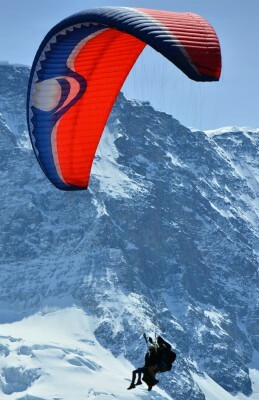 For further information about the Matterhorn and Valais, visit www.valaistourism.ch.